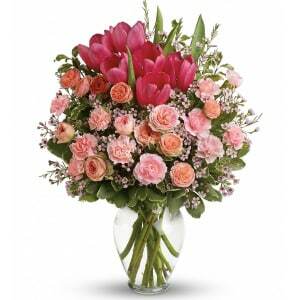 Send your condolences with tulips and radiant roses. • Includes pink roses, tulips, carnations and waxflower, accented with fresh pitta negra and variegated pittosporum. • Delivered in a lovely glass vase. 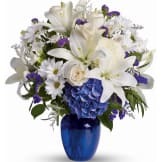 Flowers will be received by a Hunn, Black & Merritt Funeral Home & Crematory's staff. • Standard: approximately 14 1/2" H X 12" W.
• Deluxe: approximately 15 3/4" H X 12 1/2" W.
• Premium: approximately 17" H X 13" W.
I was very pleased with my recent purchase. It was delivered promptly and the bouquet looked beautiful. Thank you! Service was excellent because flowers were on time at the Visitation. But this bouquet is extremely small and looked poor. Have no green leaves at all that maybe could increase the size. I'mean assuming this is my own fault because you describe the size in the Web page but still is difficult to imagine how small it results to be. I was truly disappointed when I looked at the bouquet. Maybe you can do something for next customer for the bouquet to look a little bigger and round. Thanks. Rosa Maria. The bouquet that was delivered was a beautiful arrangement of pink carnations and roses with babies breath and greens. Although it did not have any tulips (probably because they are out of season) I really liked it better without the tulips. 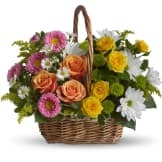 All of our flowers are designed and delivered by hand from a local florist in in Quinton.